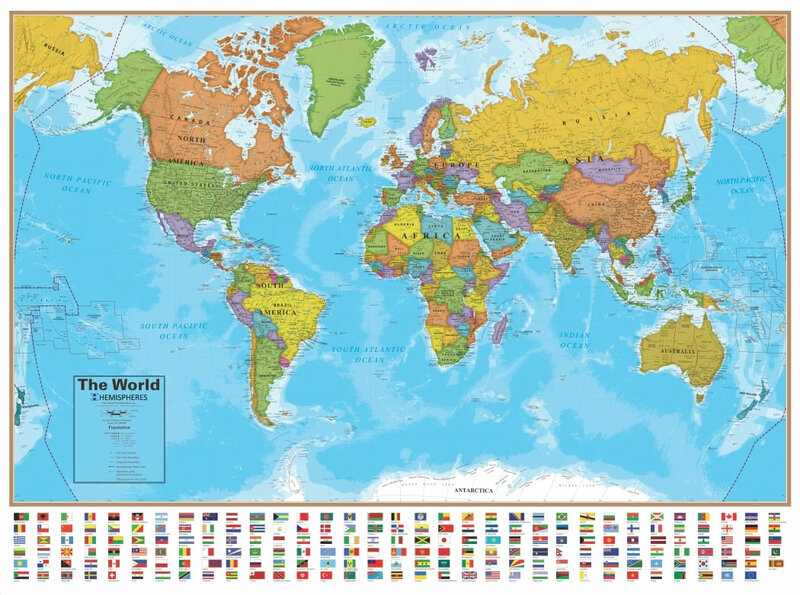 Wall Map of the World - Laminated - Just $19.99! Map Dimensions: 38 inches tall x 51 inches wide. Click here for more detail. The Blue Ocean Laminated Wall Map of the World is the best wall map value in our store. It is inexpensive, laminated for durability, vibrantly colored, large format, and highly informative. We are able to offer it at a very attractive price because it is produced in large numbers. This is a beautiful map with wonderful blue oceans, brightly colored countries, and great geographic detail. 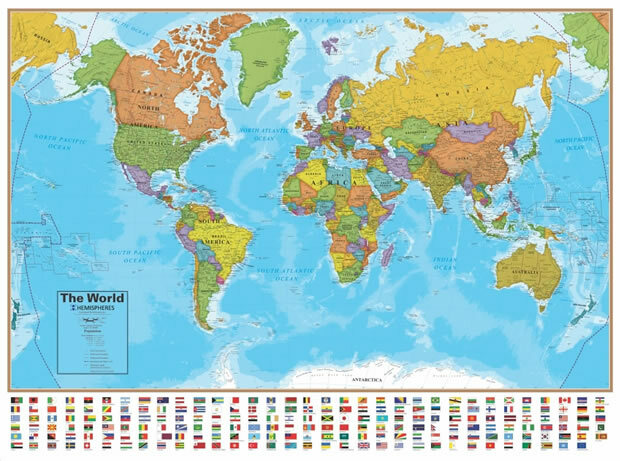 It is perfect for students, schools, offices, homes, or anywhere that a world map is wanted for education, display, or decor. The lamination protects the map and allows you to write on it with dry-erase markers and easily wipe it clean. Lamination makes it easy to hang and protects it while being handled. On land, major cities and capital cities are marked with symbols that indicate their relative population. In the United States, state boundaries, capital cities and major cities are shown. In Canada, provincial boundaries, major and capital cities are shown. The highest point on each continent is marked, along with a few other significant mountains. The map represents the world at a 1:31,758,000 scale in a Van der Grinten projection. The Blue Ocean map shows ocean depths with color shading in enough detail that you can trace the mid-ocean ridges. It includes lots of information on tiny islands that you probably didn't know existed. Depths are marked at significant locations. The International Date Line is marked along with latitude and longitude lines. One of the most valuable uses of a world map is in the home. The news, the products that we purchase, the people we know, and the places where we need to travel are often from or at distant locations. We can use the world map to learn about these distant locations and help us appreciate their relevance to our lives. This is a great map for those who are home schooling. Afghanistan, Albania, Algeria, Andorra, Angola, Antigua and Barbuda, Argentina, Armenia, Australia, Austria, Azerbaijan, Bahamas, Bahrain, Bangladesh, Barbados, Belarus, Belgium, Belize, Benin, Bhutan, Bolivia, Bosnia and Herzegovina, Botswana, Brazil, Brunei, Bulgaria, Burkina Faso, Burundi, Cambodia, Cameroon, Canada, Cape Verde, Central African Republic, Chad, Chile, China, Colombia, Comoros, Congo, Costa Rica, Croatia, Cuba, Cyprus, Czech Republic, Democratic Republic of the Congo, Denmark, Djibouti, Dominica, Dominican Republic, East Timor, Ecuador, Egypt, El Salvador, Equatorial Guinea, Eritrea, Estonia, Ethiopia, Fiji, Finland, France, Gabon, Gambia, Georgia, Germany, Ghana, Greece, Grenada, Guatemala, Guinea, Guinea-Bissau, Guyana, Haiti, Honduras, Hungary, Iceland, India, Indonesia, Iran, Iraq, Ireland, Israel, Italy, Ivory Coast, Jamaica, Japan, Jordan, Kazakhstan, Kenya, Kiribati, Kosovo, Kuwait, Kyrgyzstan, Laos, Latvia, Lebanon, Lesotho, Liberia, Libya, Libya, Liechtenstein, Lithuania, Luxembourg, Macedonia, Madagascar, Malawi, Malaysia, Maldives, Mali, Malta, Marshall Islands, Mauritania, Mauritius, Mexico, Micronesia, Moldova, Monaco, Mongolia, Montenegro, Morocco, Mozambique, Myanmar (Burma), Namibia, Nauru, Nepal, Netherlands, New Zealand, Nicaragua, Niger, Nigeria, North Korea, Norway, Oman, Pakistan, Palau, Panama, Papua New Guinea, Paraguay, Peru, Philippines, Poland, Portugal, Qatar, Romania, Russia, Rwanda, Saint Kitts and Nevis, St. Lucia, St. Vincent and The Grenadines, Samoa, San Marino, Sao Tome and Principe, Saudi Arabia, Senegal, Serbia, Seychelles, Sierra Leone, Singapore, Slovakia, Slovenia, Solomon Islands, Somalia, South Africa, South Korea, South Sudan, Spain, Sri Lanka, Sudan, Suriname, Swaziland, Sweden, Switzerland, Syria, Tajikistan, Tanzania, Thailand, Thailand, Togo, Tonga, Trinidad and Tobago, Tunisia, Turkey, Turkmenistan, Tuvalu, Uganda, Ukraine, United Arab Emirates, United Kingdom, United States, Uruguay, Uzbekistan, Vanuatu, Vatican City, Venezuela, Vietnam, Yemen, Zambia, Zimbabwe. We will ship this map to you, neatly rolled in a sturdy map tube to make sure that it arrives in perfect condition. We ship all laminated maps through the United States Postal Service by Priority Mail. You should receive it in just a few days, even if you are in Hawaii, Alaska or one of the United States Territories (sorry, we are unable to ship any purchases outside of the United States and its official territories, except for APO and FPO addresses). If you order other items at the same time, your maps will be shipped in a separate tube.